As the temperature begins to grow warm, dog-parents get worried as the flea season is about to take off in full swing. Ask any pet-parent what they dread the most, and many will say a flea or tick infestation. These tiny parasites are a nuisance as they put our beloved pets in pain and pose severe risks to their health. Not to forget the excessive cleaning that needs to be done after the animal is treated, all of this is itself a nightmare. Well, wouldn’t it be better to take preventive measures beforehand to save yourself and your pooch the trouble? In this article, I will be sharing six useful tips to protect your dog from flea infestations. But first, let's have a glimpse at what these parasites are and why they are dangerous. Fleas are tiny parasites that solely feed on the blood of mammals. These insects jump from one host to another, carrying infections and laying eggs during the process. There are specific types of these insects that feed on a particular kind of species such as cat, dog or even human fleas. Their bites cause itchiness which may lead to the formation of scabs on their skin. If your dog ingests a flea, it can cause tapeworms. Another threat that these parasites pose for the young puppies is anemia. It is a condition in which the red blood cell count decreases, and can be life-threatening if not treated on time. Ticks are another form of parasites and are more dangerous than fleas due to the risk of various diseases they may transmit to our dogs. The most common ones include Lyme disease, anaplasmosis, and even respiratory failure or paralysis due to the type of toxins they release. Bathing your dog plays a crucial role in keeping his coat healthy and free from parasites. The critical part here is to realize your dog’s need for baths. For dogs with oily skin, a good shower once in one or two weeks would do. However, if your dog has a water-repellent coat such as that of the Golden Retriever, frequent baths may strip off the natural oils. 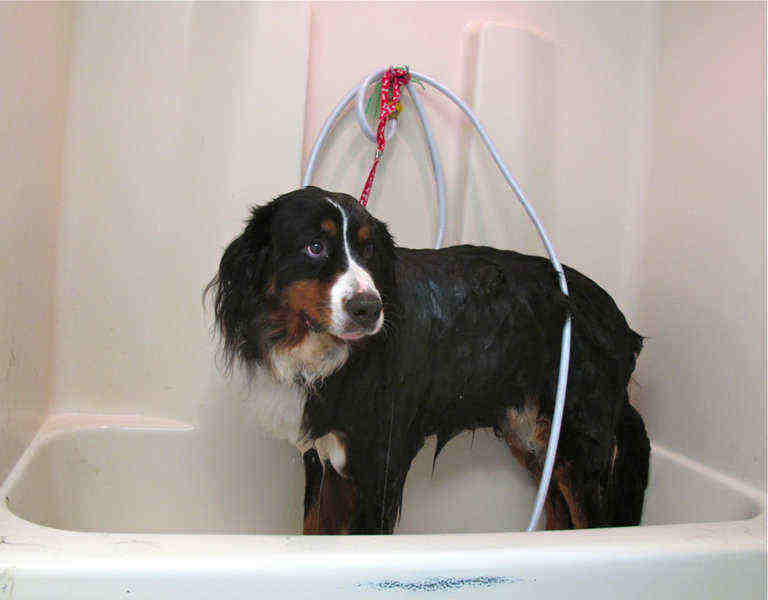 As a rule of thumb, whenever your dog becomes a bit too smelly, it is time for the chore of bathing. You can use a medically formulated shampoo that repels fleas and control ticks; the veterinarian can prescribe you one. If not then create your own at home by mixing equal proportions of your dog’s regular shampoo and lemon juice (half a cup of both) with 2 cups of water and use it to bathe your pooch. Apple cider vinegar is one of the preventives which doesn’t only protect your dogs against fleas, but may also kill them. A plus about apple cider vinegar is that it is mainly beneficial for your dog’s coat and keeps it moisturized & shiny. You can utilize ACV in different ways. Add a few drops of the vinegar to water and bathe your dog with it. You can also create a spray yourself. Mix equal amount of the vinegar with water and spray it over your dog before he heads out to prevent him from these pesky pests. Carefully mist the mixture on the face to prevent it from getting in your pup's eyes or nose. Investing in a flea comb can be beneficial as it keeps your dog clean, groomed and healthy. Pick a good quality comb that will last you longer and can take out the eggs and larvae if there are any. How to Comb Your Dog? Keep a bowl of hot water next to you before you begin combing your dog as it will be used to kill the fleas. I would recommend doing this outside the house to avoid the risk of spreading any larvae or eggs on the carpet or floor. You should start with your dog’s ears and continue towards the tail. While you comb your pup, make sure you keep an eye on the areas such as the backside of the neck and the rump as the fleas seek refuge in these parts. After completing the process drain the water; repeat the procedure once a day if the infestation is high. Your dog’s bed can hide various bacteria, even these pesky parasites which can be carried to other pieces of furniture. Hence it is crucial to wash the bed with hot water and a powerful detergent every week. Drying the fabric at the highest temperature setting of your dryer also helps in killing the eggs, larvae, and fleas. Lavender is one of the essential oils that are beneficial for preventing fleas. You can use it in many ways, for instance, spray a few drops of the oil on your pet’s bedding or add a few drops to the rug shampoo to protect your carpets. You can also use it as a spray and apply it directly to your dog’s skin. Another tip is to create your dog collar with flea repelling properties at home. Add 15 drops of lavender essential oil to a tablespoon of carrier oil to make a solution. Get a woven dog collar and dip it into the mixture for about 5 to 10 minutes. Dry it thoroughly, and tie it around your dog’s neck. Diatomaceous Earth, also known as DE is useful for killing fleas in your yard. You can spray the dust in infested areas of your garden, such as the places where your dog sleeps or plays. Scatter DE in those areas; make sure there is no moisture in the grass when you sprinkle the dust. One thing to keep in mind is to purchase the food grade DE as it is safe for usage in pet-friendly houses. You can also use it for the carpets or rugs to kill fleas. Sprinkle the dust and let it rest for a day before you vacuum.